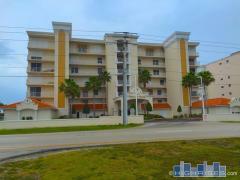 Canaveral Towers is a 9-story high-rise located right on the water in Cape Canaveral. Amenities at Canaveral Towers include a heated swimming pool, sauna, putting green, shuffleboard, and a clubhouse. This is one of the tallest condo buildings on the Space Coast of Florida. Have any comments or questions about Canaveral Towers? Ask your question and/or share your thoughts about this Building.